A KAIST research team successfully identified the underlying principles behind electron heating, which is one of the most important phenomena in plasmas. As the electric heating determines wide range of physical and chemical properties of plasmas, this outcome will allow relevant industries to extend and effectively customize a range of plasma characteristics for their specific needs. Plasma, frequently called the fourth state of matter, can be mostly formed by artificially energizing gases in standard temperature (25°C) and pressure (1 atm) range. Among the many types of plasma, atmospheric-pressure plasmas have been gaining a great deal of attention due to their unique features and applicability in various scientific and industrial fields. Because plasma characteristics strongly depends on gas pressure in the sub-atmospheric to atmospheric pressure range, characterizing the plasma at different pressures is a prerequisite for understanding the fundamental principles of plasmas and for their industrial applications. In that sense, information on the spatio-temporal evolution in the electron density and temperature is very important because various physical and chemical reactions within a plasma arise from electrons. Hence, electron heating has been an interesting topic in the field of plasma. Because collisions between free electrons and neutral gases are frequent under atmospheric-pressure conditions, there are physical limits to measuring the electron density and temperature in plasmas using conventional diagnostic tools, thus the principles behind free electron heating could not be experimentally revealed. Moreover, lacking information on a key parameter of electron heating and its controlling methods is troublesome and limit improving the reactivity and applicability of such plasmas. 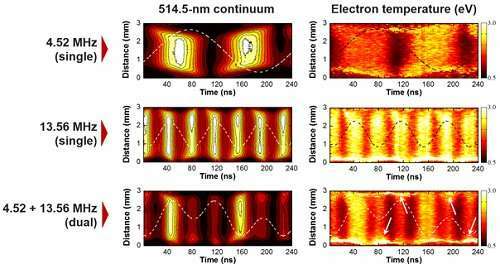 To address these issues, Professor Wonho Choe and his team from the Department of Nuclear and Quantum Engineering employed neutral bremsstrahlung-based electron diagnostics in order to accurately examine the electron density and temperature in target plasmas. In addition, a novel imaging diagnostics for two dimensional distribution of electron information was developed. Using the diagnostic technique they developed, the team measured the nanosecond-resolved electron temperature in weakly ionized collisional plasmas, and they succeeded in revealing the spatiotemporal distribution and the fundamental principle involved in the electron heating process. The team successfully revealed the fundamental principle of the electron heating process under atmospheric to sub-atmospheric pressure (0.25-1atm) conditions through conducting the experiment on the spatiotemporal evolution of electron temperature. Their findings of the underlying research data on free electrons in weakly ionized collisional plasmas will contribute to enhancing the field of plasma science and their commercial applications. Professor Choe said, "The results of this study provide a clear picture of electron heating in weakly ionized plasmas under conditions where collisions between free electrons and neutral particles are frequent. We hope this study will be informative and helpful in utilizing and commercializing atmospheric-pressure plasma sources in the near future." Articles related to this research, led by Research Professor Sanghoo Park, were published in Scientific Reports on May 14 and July 5.